Pubs. Not really places you'll usually find me, cause I'm a bit of a sheltered grandma somtimes.. but when Social Modern Pub invited me in to check out their menu, I couldn't refuse. Oops, now you all know I'm a bit of a grandma. 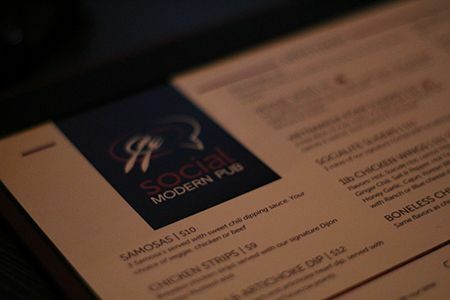 When I headed down to Social Modern Pub, it was a little bit hard to find - not on the main road, but off to the side. It really is a hidden gem in the downtown area, not to mention they have tons of parking available! I met one of my girlfriends here on a Friday night around 6:30, and while it wasn't packed, I would say it was at or a bit over half capacity. Being Halloween party weekend, it was understandable, and I actually liked having a bit more space there for ourselves! 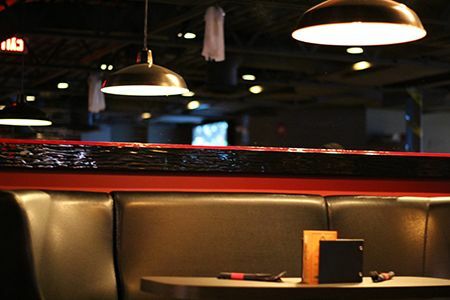 Walking in, the leather seats and mirrors among the red and black decor gives the place an upscale feel, while the flatscreens on the wall still make it a great place to come down and watch the game with friends. 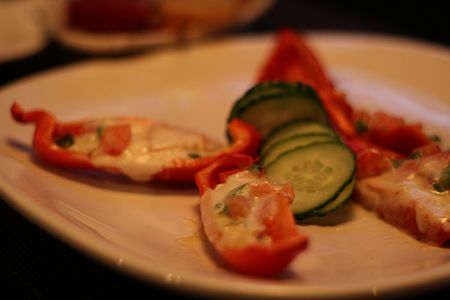 To start off, we ordered the Veggie Skins ($9): Our vegetarian version of the classic potato skins. Red and green pepper skins topped with roasted garlic, onions, tomatoes and Bocconcini cheese. I hadn't known what to expect, but was surprised with what arrived on the plate. The red peppers still had crispness to them, and the melted cheese held all toppings together. It could've used a little bit more seasoning in my opinion, but it's so healthy and I want to make these at home now for when I'm studying! 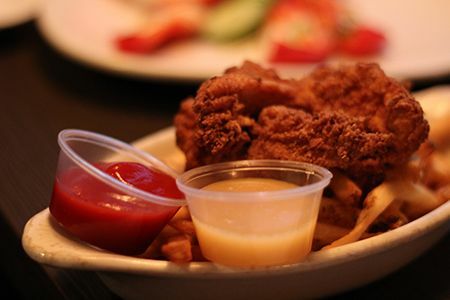 Next up was the Chicken Strips ($9): Breaded chicken strips served with our signature Dijon Honey Mustard aioli. They make these in house, and are nothing short of delicious. The chicken is very tender, coated in a flavourful breading and served nice and crisp. I would order these again in a heartbeat. What we hadn't realized was that they would be served with fries - it left us wanting way more chicken and fewer fries. For mains, we ordered two to try out and the Lamb Burger ($14) came out first: 6oz Homemade Lamb burger, topped with spinach, tomato, feta and mint aioli. First of all, we substituted yam fries for regular fries, and they are fantastic here! They have the perfect amount of crunch to go with the paired garlicky aioli. The lamb burger itself was quite good - it had a small trace of that gamey flavour, but the patty held itself together well. The only thing was it was a little on the dry side for me, so a little more of the aioli added in there fixed it up. 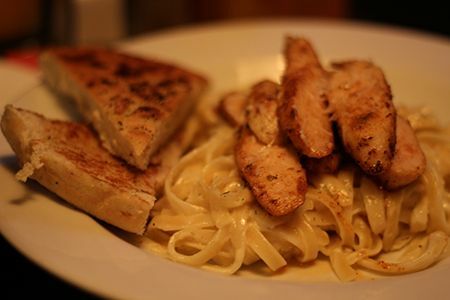 Our second main, the Brandied Cajun Chicken Fettucini Alfredo ($15) is something I never thought I would order in a pub atmosphere. But there's a first for everything, right? Sautéed chicken dusted in Cajun and flambéed in orange brandy. Laid on a bed of fettuccini topped with Alfredo made from scratch. The alfredo pasta was cooked al dente, and the sauce was very rich and creamy - I could really taste the butter in there. Mmm, calories! The sauce ensured that the pasta did not start sticking to itself even after cooling down - but the problem was that the sauce itself didn't have much flavour to it. All the flavour in the dish was in the chicken, so eating the pasta was best paired with the chicken. The pasta was a nice surprise, and I would love to try some of the other pastas they have. On this particular night, we were able to meet and speak with the General Manager Ian who is extremely friendly and outgoing, making trips around the pub and taking the time to talk to everyone and make sure they're having a great time. We were chatting away, until he professed his love to bacon to us! One thing lead to another, and before we knew it, a plate of bacon wrapped bacon was making its way to our table! The bacon wrapped bacon is currently unavailable, but will be found permanently on the new menu soon. 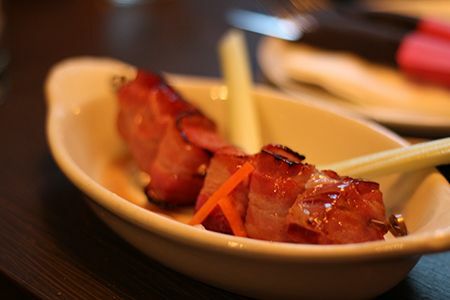 The dish itself is a substantial chunk of back bacon wrapped in candied bacon and drizzled with some maple syrup on a skewer. I'm not a huge bacon fan myself, but this was delicious. It was perfectly sweet and salty, and the celery and pickled carrot & daikon on the side made me feel just a little healthier. 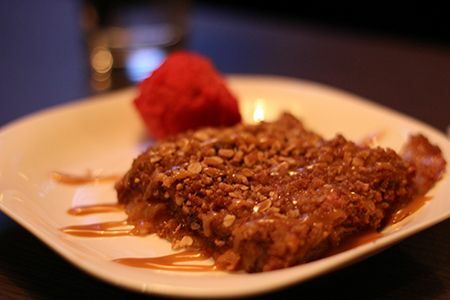 And as if I wasn't ready to explode already, I ordered the Warm Apple Crisp ($7): Just like Grandma makes, warmed up and served with a scoop of vanilla ice cream. The apple crisp was less on the crispy side, and more like a ooey-gooey dessert that was just the right amount of sweet to end the night. 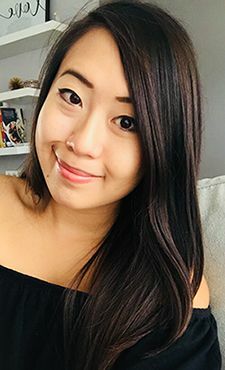 Overall, I had such a great time at Social Modern Pub, and would return again if I were in the area. Our server was so friendly, and the environment is perfect for a night out with friends. 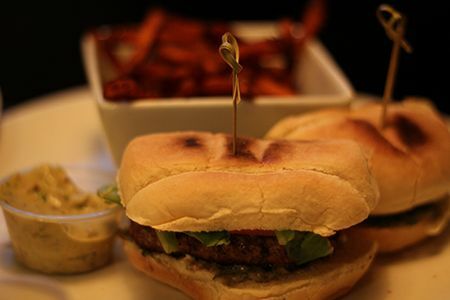 The menu changes up every 3-4 months, and the kitchen is open as late as 1:00 AM if you're looking for late night eats. They have so many great specials everyday too, giving patrons more incentives to go! Mondays they give out free steak sandwiches, free wings on Wednesdays, and 50% off for the ladies on Saturdays are just a few of the many things they do throughout the week! 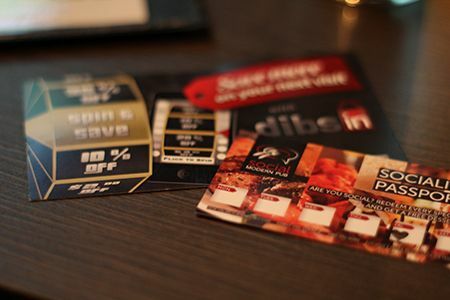 They use the DibsIn app and also feature a Socialite Passport (seen above) you can have stamped each time you visit to earn a free dessert! Their deals are so crazy, check them out! Andrea, that is the classiest pub! It's really chic! I love the decor and the preparation of dishes is awesome. Overall, it looks like everything was good. I can't get over the veggie skins! Great alternate for potato skins. Excellent review and glad you enjoyed yourself. Looks delicious!! Veggie skins sounds interesting! I never seen that before on a menu... now makes me wanna try to make it! haha..
Great post and review Andrea! I totally want to make them at home! So yummy. Great pictures, the food looks so tasty! It´s the firt time than i see your blog... It´s really lovely and cute! the food looks delicious! !